A child raised by a parent with borderline personality disorder has one of the most difficult childhoods to navigate. Since this type of parent is unable to successful maintain a marriage they are often left to raise their child alone. Without the buffer of a second parent the child is often left to suffer alone. The Challenge: A borderline personality disordered (BPD) individual has a very fragile and unpredictable personality. They may be highly educated and have very successful careers. However, they struggle with interpersonal relationships because they are too fragile to be effective. They are very much like emotional children locked in an adult body, expected to function in adult relationships. When things are going their way, they can be delightful and charming. As soon as they do not get their way, or someone crosses them, they will quickly resort to destructive means to stabilize their fragile sense of self. This pattern creates a very anxious child. They are never sure which parent will be there to meet them after school. Coping Mechanisms: The BPD’s greatest fear is to be abandoned and they will do just about anything to avoid the crushing blow of perceived rejection. They must feel they are loved at all times. They will create dependency in their child and will have difficulty seeing their child as separate. Sadly they “split” which means they view others, including their children, as either all good or all bad. They do not allow themselves to acknowledge anything in the “gray” area of life where most of reality exists. For example, if their child loves the other parent, then the BPD parent will over-react and believe they are being rejected by their child. They teach their child that if they want to feel safe then they have to adore them. They make it known in every possible way that “You are for me or you are against me.” If there is more than one child, the BPD parent may even idealize one child and reject the other. Besides splitting, the BPD parent will distort reality to make sense of inner emotions. For example, if the BPD parent and child have a conflict, the BPD parent will remember the conflict in a completely distorted way to protect themselves from feeling responsible. This creates tremendous confusion for the young child. Typically the parent is too fragile to take responsibility for any relationship problems. If they did, they would quickly spiral into feeling worthless. So instead they will distort the external facts to make sense of their internal experience. They will even go so far as to outright lie to cope with reality. It is common for them to turn the facts around to make the child feel responsible for what they are actually doing. The child’s reality is rejected and told it is wrong. The BPD often projects what they are doing onto the other person as a form of “gas lighting.” The crazy making of gas lighting leaves children doubting their own reality. In addition, the BPD parent will confuse their children when they project their own behaviors onto someone else. For example if the BPD parent lies, they will say others are lying to them. Furthermore, the BPD parent can be very impulsive leading to inappropriate rage that may be directed at a frightened child. Early childhood versus Adolescence: When children are very young they are able to demonstrate their love in many wonderful ways. They make homemade cards of adoration, they want to cuddle with you and tell you that you are the best parent in all the world! With time, as they develop and move towards autonomy they are less likely to demonstrate this devotion. The parent-child relationship of adolescence is typically not always a give and take relationship like that of early childhood. As a result, the BPD parent may appear to others to be caring adequately for the children while they are young. However, the BPD parent will completely digress when their child moves into adolescence. A healthy teen will begin detaching and seeing things in their own way. The BPD parent finds adolescence intolerable to their sense of self. As a result, the teen will give in and allow the BPD parent to control them while staying overly attached or they will begin to separate and fight with the BPD parent. These arguments are far worse than the usual parent-child conflict of adolescence because the BPD parent will fight dirty and impulsively, saying the worse possible things to their child. They will threaten to reject their child or threaten to harm themselves, creating tremendous anxiety for the child. When the BPD parent’s fears become triggered they will resort to blame, guilt, shame, verbal abuse and any other form of manipulation to get their way. Some will even resort to physical abuse when they become desperate enough to stabilize their ego. Impact of BPD Parenting: Children raised by a BPD parent are typically highly anxious, hypervigilant, insecure and lack self-confidence. Some become depressed and may even harm themselves in adolescence. They may have academic problems or throw themselves into school and activities to minimize time at home. They learn not to bring friends home. Many of these children become “parentified”, meaning they become adults while still children. They lose their childhood emotionally caring for the fragile adult. Many become passive to avoid the rage and others remain enmeshed never leaving home. Children of BPD adults seem to have the highest risk of becoming alienated from their other parent or extended family. Alienation is a form of emotional abuse costing a child their relationship with a parent. Other relationships must never complete with the BPD parent. Some of the worst issues of being raised by a BPD parent include living with unpredictable behaviors, mixed messages and mood swings. This interferes with the child’s sense of safety and trust. Furthermore, the parent’s distortions can create significant distress for young children who believe their parents are always right. Long term, the child is at serious risk of doubting his/her own perceptions. They live with the anticipatory anxiety of a parent who can be fun one minute but get threatening and shift into rage with little warning. 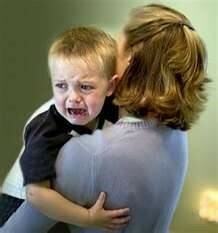 The emotional blackmail and use of guilt to control creates very anxious and/or angry children. Two classic books summarize the impact of living with a BPD person. “Stop Walking on Egg Shells by Randi Kreger and Paul Mason and Understanding the BPD Mother by Christine Ann Lawson are both excellent resources. How to help: Children raised by BPD parents need to minimize their time with the BPD parent. When this is not possible, then the parents should find a way to have a parenting coordinator appointed to monitor their family. At minimal the child will need to have a safe place such as therapy, to explore and sort out their confusion and fears. The BPD parent cannot be involved in their therapy and should not be included in feedback other than in very general terms. If the BPD parent must transport the child to therapy, the BPD parent needs to be reminded that they are not to ask questions of their children about their counselling session especially on the drive home. If need be, counselling treatment for the child may need to be court ordered to be successful. Ultimately, the child must come to understand that they were not the problem as they were told. They will learn over time with the therapist’s assistance that their parent is extremely challenged. This is an important shift and a gift to a child that should be explored by a trained therapist who will know when the child is ready for greater understanding. According to Kreger, A BPD parent’s abuse can leave deep wounds. Trying to manage it can be a lifelong process but with a good therapist and a community of others who have gone through the same thing, (the adult child) can get better.